How much would you want for the sandworm costume? It's the best one I've seen! I'm not even sure I have it anymore lol. We've moved a couple times since then. I do still have the Beetlejuice costume though. Thanks for responding!! I have a Beetlejuice costume, so if you find the Sandworm, let me know. It is really stellar. Thanks! I'll let you know if I find it. Any chance you still have the pattern for the Sandworm? No sorry. I didn't use a pattern. I just kinda winged it. 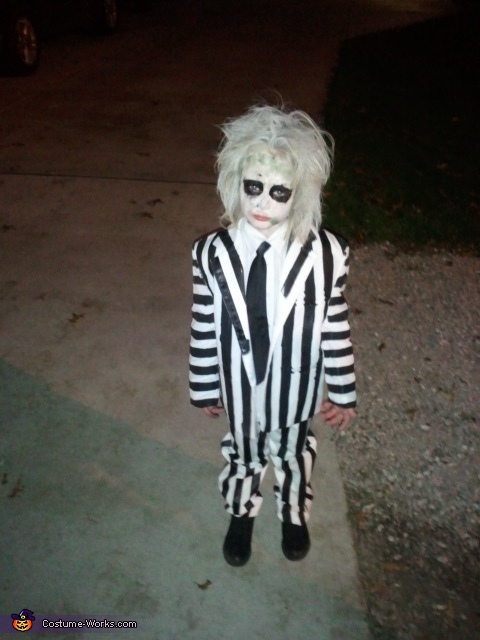 Do You still have this Beetlejuice costume? How did you make the sandworm? Nicole, I have the pants and jacket still, no tuxedo shirt or tie anymore. I do have boy number three on the way though, so I'll probably acquire those again in the next few years so he can wear it as well. Denise, I cut strips of black and white felt and sewed them together. Then I cut out the shape of the sand worm to see. I did all the teeth individually and stuffed them. Lined the lips with green and hid wires in them to hold their shape, more sewing. And buttons for eyes.